To be fair, there isn’t a ship or an iceberg in sight in director Abhishek Kapoor’s love story. But Kedarnath, set against the devastating Uttarakhand floods of 2013, is basically Titanic beat for beat. Kedarnath ultimately falls short of living up to its promise, but I was happy to visit its world. The imagery is overwhelming, even if the writing feels laboured. I’m going with two-and-a-half out of five. The films wants to be too many things – there is a running sub-plot involving Mukku’s sister. Abhishek and Kanika also bung in an environmental angle. The second half has so much stuffed into into it that little makes an impact – including the flood. Afterward I found myself thinking of the luminous Sara and this lovely line by lyricist Amitabh Bhattacharya in the song Qaafirana – aise tum mile ho jaise mil rahi ho itr se hawa. I wish the rest of Kedarnath had matched the magic of that. I’m going with two and a half stars. On the whole, Kedarnath is a well-made film but which lacks the excitement of a love story. As such, it will not be able to make money at the ticket windows – and this, also because the investment in the film is more than the project deserved. Director Abhishek Kapoor’s attempt to make a film set against the backdrop of a natural calamity of this proportion is ambitious and sincere. The setting is what makes a difference, because the simple and predictable love story doesn’t really rose above the water level. The clever use of CGI mixed with live-action shots to depict moments like cloudburst and the pilgrim city submerging underwater creates an authentic impact. The execution in these areas, along with a memorable debut by Sara, is what keeps the film afloat. And that’s the trouble with Kedarnath. Using the devastating 2013 Uttarakhand floods as a major plot twist should have given the film some depth. But the writing is sketchy, and the tone confused, never quite knowing whether to go quiet and life-like or to swell with wailing violins, especially when the waters start rising, and life-threatening danger starts looming.In trying to please everyone, the film loses edge, and leads to a tepid cop-out. It’s a weepie minus the tears. Abhishek Kapoor and Kanika Dhillon’s story is extremely weak. The Hindu-Muslim love story has been done to death and it seems forced here just for the heck of it. Kanika Dhillon’s screenplay is inconsistent. A few scenes are decent but overall, it lacks any novelty and excitement. Kanika Dhillon’s dialogues however are impactful.On the whole, KEDARNATH is a poor fare owing to the unexciting and flawed writing and weak execution. What works well is Sara Ali Khan’s stupendous performance and the flood sequences. At the box office, its fate will be an average one. The narrative is unimaginatively predictable, one that Mani Ratnam had marvellously mastered in his 1995-blockbuster Bombay. However, Kapoor is unable to ignite that same brilliance on his canvas.A possibly bigger budget for special effects would’ve uplifted the movie to greater heights but shoddy patchworks at crucial points and an unoriginal soppy climax derides the movie of finesse.At over two hours of screen time, the drill turns tedious and tiresome, and sinks into a mushy mess in the end, never ever coming together as a wholesome movie. While the director should be given the credit for making a film about Kedarnath floods, he is also guilty of cramming in too many things in a 2-hour, 25 minute film. 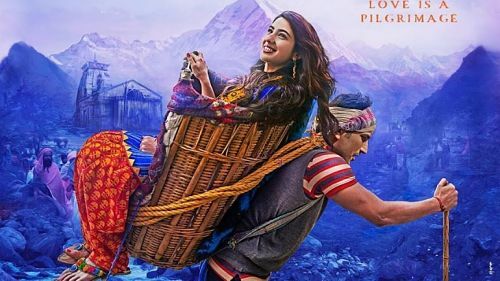 By the second half, you don’t know where to invest your emotions – should it be the inter-faith couple, the commercialisation plan of Kedarnath at the cost of its ecological imbalance or the massive human tragedy of floods.Kedarnath fails short of stirring up emotions the way it intends. It ends up being an empty, unmoving watch. While the film is interesting in parts, it doesn’t wholly come together primarily because there’s a lot going on. Just as you were about to invest our faith in the star-crossed lovers, the movie yanks you out of that pleasant feeling with scenes of widespread destruction.There’s no tsunami of feelings for the on-screen couple here because they aren’t emotionally potent. However, everything in this film is blessedly brisk — be it falling in love or a flood that swallows half the town.‘Kedarnath’ is perfectly stormy and is good for a one-time watch. In 2013, a wealthy Hindu girl, Mukku, takes a pilgrimage to the historic Kedarnath Temple in the Uttarakhand mountains; she soon meets and falls in love with Mansoor, a humble Muslim boy, who becomes her guide. As their relationship grows closer along the journey, the pair face many obstacles, including familial disapproval and contrasting backgrounds; when the sudden rains of the 2013 Uttarakhand floods devastate the region, the couple are forced to survive against the elements and face the ultimate test of their love.